Many different aphid species feed on ornamental landscape plants. Aphids feed by inserting thin mouthparts into the plant phloem and sucking out sap. There are so many species of aphids it is difficult to generalize their appearance. Aphids are globular and 1 to 6 mm long depending on life stage and species. They can be black, brown, yellow, red, gray or green. Most aphids do not have a waxy covering, although the bodies of some of the woolly aphids, such as woolly apple aphids, are covered with white, waxy threads. Some aphids have white spots or are completely covered with a white waxy powder. The legs and antennae are usually long and fragile. Aphids may be wingless or have functional wings. The offspring are smaller than the adults and are always wingless. Aphids feed on plant phloem with piercing-sucking mouth parts called a stylet. Phloem contains sugars made by photosynthesis in the leaves that plants need for growth and storage. When aphids are abundant they can remove enough sap to reduce plant growth. In addition, aphids inject saliva into plant tisue as they feed which some plants to develop curled, hardened or distorted growth. Some aphids also transmit plant viruses. Aphids excrete a sweet, sticky liquid called honeydew. 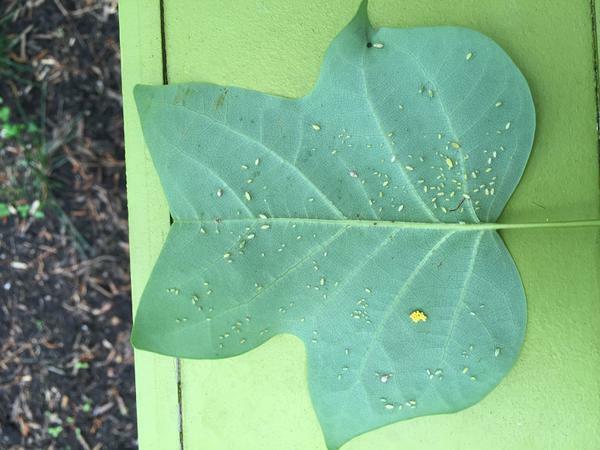 When aphids are abundant, honeydew often completely coats leaves and other object below, giving infested plants a sticky or varnished appearance. Honeydew attracts ants, flies, wasps and other insects. Unsightly fungi called sooty molds often develop in honeydew. 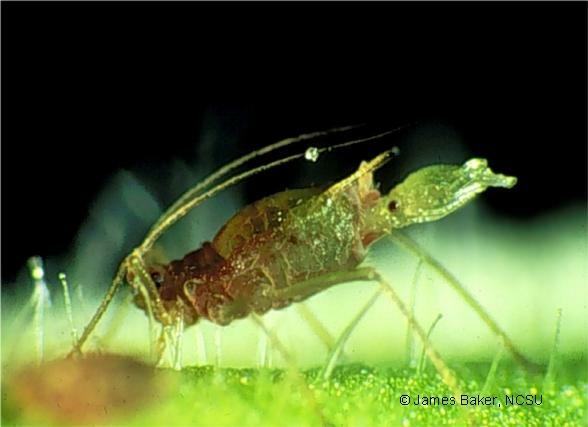 Many species of aphids in North Carolina overwinter in the egg stage, however, during the growing season, all aphids give birth to living young. The young aphids mature in about 10 days. Most aphids species have several generations per year. 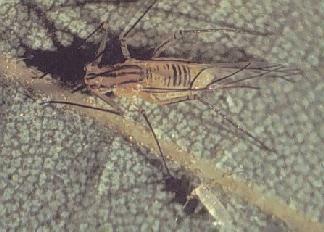 Both winged and wingless aphids are born during the growing season. Winged forms migrate to start new colonies. Some aphids move to other plant species because, like the green peach aphid, they are generalists and feed on hundreds of plant species. Other aphid species, like spiny witch-hazel gall aphids, have obligate alternate host that are required for sexual reproduction. Although most aphids attack the tender stems and leaves, some feed on woody stems and a few feed on roots. For example, the woolly apple aphids feeds on the leaves of elm trees and the roots and stems of crabapples, apples, and pyracantha. If you have identified aphids on your plants look for information on that aphid species to determine when to scout. In general, look for shiny patches of honeydew on leaves then inspect the leaves above for aphids. 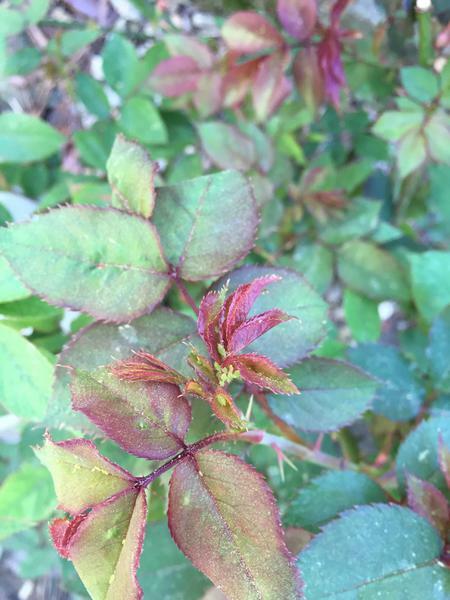 Some plants, like roses or crape myrtle, routinely get aphids so monitor plants in spring and early summer to determine if intervention is needed. 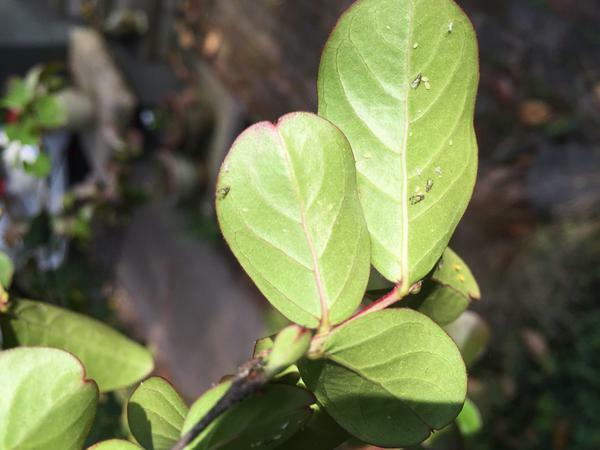 Aphids frequently can be found on roses, milkweed, crape myrtle, perennials, and herbs but most plant species will host at least one aphid species. Aphids may be the most common insect family on most landscape plants. Removing every aphid is not possible or advisible. In most cases aphids will occur at low densities and do not require intervention. If aphids become abundant enough to cause distorted growth or damage flower buds intervention may be warranted. The decision comes down to the amount of insects and damage you can tolerate and for how long. Many aphid infestation disappear in a matter of weeks as natural enemies colonize the plant. Cultural Control: Aphids and many other pests thrive on plants that are under stress or that have received nitrogen fertilizer. Both of these factors can reduce plant defenses and make them more nutritous for pests. 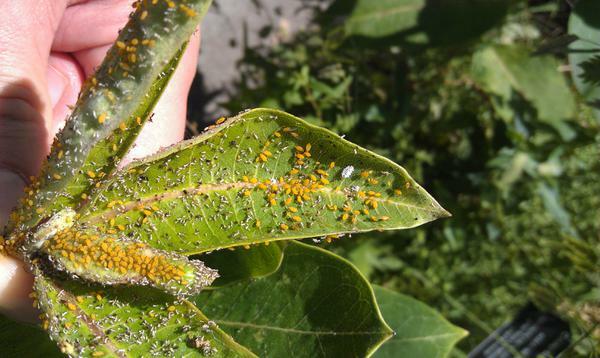 Mechanical Control: Aphids typically occur in groups that can be pruned from a plant. 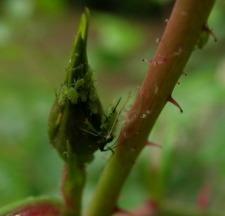 For example a single rose stem may have a dense colony of aphids whereas the rest of the plant may be clean. Removing the infested stem could fix the problem and negate the need for insecticides. Aphids and aphid colonies can also be dislodged with a stream of water. Biological Control: Natural enemies of aphids include ladybird beetles and their larvae, green lacewings and their larvae (aphid lions) which sometimes disguise themselves with debris, hover fly maggots, parasitic wasps (YouTube video) and entomophagous fungi. Often times as aphid populations grow natural enemies colonize in suffient abundance to reduce the population. In this way aphids are good for increasing the abundance and diversity of natural enemies in your landscape. Chemical Control: Sometimes natural enemies are not able to keep aphids under control, so chemical control may be needed. Aphids are soft-bodied and can usually be killed with insecticidal soap or horticultural oil instead of more toxic products. Check the North Carolina Agricultural Chemicals Manual for other insecticides labeled for aphid management in landscapes. For assistance with a specific problem, contact your local Extension center.